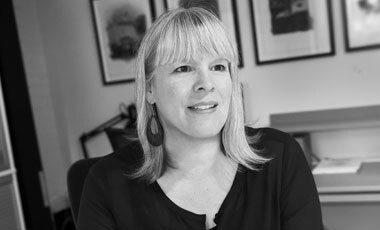 A fervent film buff, Beverley knows a winning performance and she also knows how to direct one in environmental design, excelling in all aspects, from retail to signage and wayfinding. She single-handedly manages projects and organizes scheduling in our bustling environmental department. Beverley’s extensive experience enables her to troubleshoot potential pitfalls and consistently direct every project toward a successful result, and her tremendous attention to detail ensures a project’s initial vision is fully realized. Focused and resourceful, she directs the progress of each retail project from conception through to implementation. She works closely with our graphics department to seamlessly integrate a project’s brand strategy within its retail environment to guarantee a consistent message and a cohesive look and feel. Clients include TD Bank Group, Toronto Blue Jays, OfficeMax, Seneca College and Tim Hortons.